High blood pressure is called Hypertension. This means the pressure against the walls of your blood vessels as your heart pumps blood around your body is too high. High blood pressure is a leading cause of kidney disease, heart attacks, and strokes. For adults 18 and older, blood pressure that stays at 140/90 or more is considered high. Hypertension control is important and within your control. 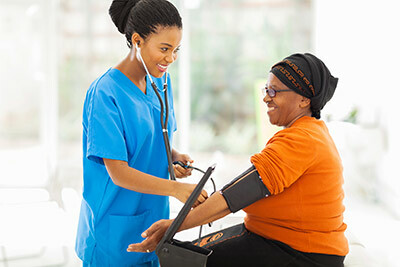 According to the American Heart Association, high blood pressure contributes to nearly 1,000 deaths per day. Controlling high blood pressure now will prevent a lot of pain later. Getting regular exercise helps keep blood pressure under control. The benefits of exercise also include feeling and looking better, reducing stress, and having better overall health. Working with your doctor and staying the course is important, as the best combination of medicines are found, since every patient is different with a different side effect profile and toleration for medicines. Some of the things that a patient can have control over are: compliance with regular medical checkups, following your doctor's instructions and taking medicines, stop smoking (if you are a smoker), avoid drinking more than one ounce of alcohol a day, and get your whole family involved in your care plan. Your kidney doctor can be your best resource for expertise and guidance, as you try to reduce your risk of hypertension related early disease and death. To get more information about hypertension, or you're looking to ask a question, or request an appointment, please fill out the contact form below. You may also email care@mykidneymtn.com, call (615) 452-3250 or click here.